Cambodia (6): Golfing in Cambodia is best from November to March when the weather is drier. Other times of the year can be wet, although showers last only 1 hour and mainly occur late in the afternoon. Experiences on the courses are good with many drink stations and well-marked signage. Thailand (10): The Thai Golf Experience is hard to describe. Take my word for it and give it a try. I guarantee you have not experienced anything like it. Anything and everything is possible when you golf in the Kingdom of Thailand. Cambodia (6): Golf in Cambodia is fairly pricey. Green fees run around $100 US Dollars a round. Caddie and cart fees, transportation to/from the courses, and tips also need to be factored into the costs. Hotel costs range from $20 US Dollar guest houses to $300 US Dollar a night 5-star resorts. Thailand (8): An overall Thailand golf vacation is affordable as hotels, entertainment, and food are all reasonably priced. Green fees start at $20 US Dollars a round at countryside courses (Khao Yai and Kanchanaburi) and go up to $200 US Dollars (Red Mountain). To get the best deals buy a package with golf, hotel, and transfers from a licensed golf tour operator. 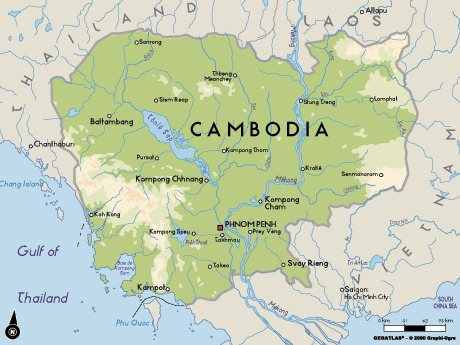 Cambodia (6.5): Golf in Cambodia is still in its infancy. As such Cambodia is not a golf destination in itself, but best combined with a golf trip to a nearby country like Vietnam. Thailand (8.7): Thailand wins over Cambodia as it is a mature golf destination, offers good value-for-money, and has service that is cannot be beaten.